- With longer days come longer hikes and coming into this spring/summer I set a goal to do as many 20 plus mile one day endurance hikes as I could. - Having already accomplished a Pemi Loop last month I was looking for another killer hike to do in the Franconia Notch region when I saw what looked to be a hidden gem of a hike. - All hikers know about the Pemi Loop as it's a very popular hike but lesser known is it's evil twin the Franconia Notch Loop...Less miles, more elevation gain, no mind-numbing flat LW/Wilderness Trail, replace the ascent up South Twin with the hike up Cannon, the hike through the Cannon Balls is a mini Garfield Ridge, and oh yeah something the Pemi Loop doesn't have the Flume Slide! 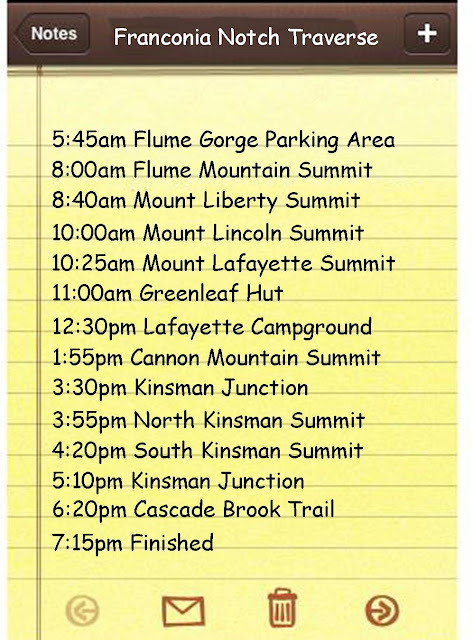 - Left RI at 3am, on trail at 5:45am, lost my marbles at 6:30pm, finished at 7:15pm. Temps above 60 below treeline, high 40's above treeline, cloudy day with s few showers, decent views along Franconia Ridge, in the clouds on Kinsman Ridge. 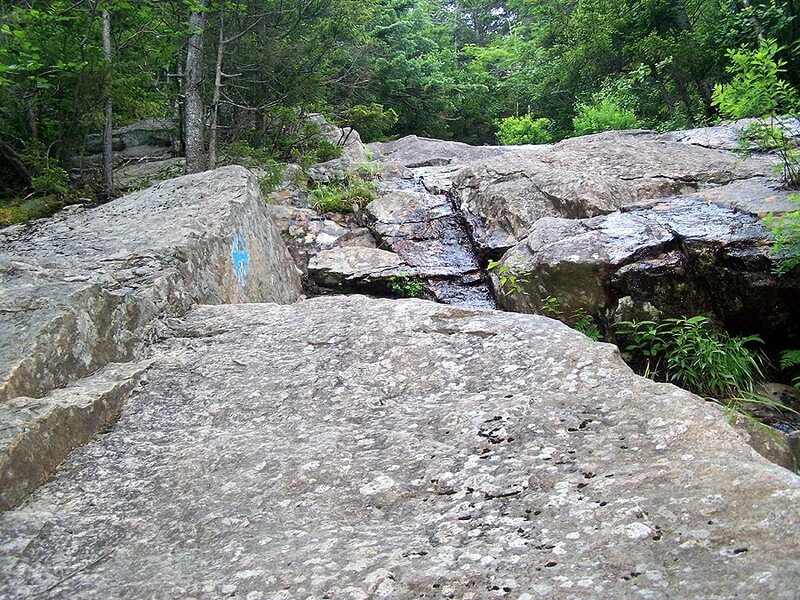 - The Flume slide is one of my favorite trails, it's a very easy hike for the first 2.6 miles until you reach the slide where you ascend 1,400 feet in .7 miles. The trail basically becomes huge sections of steep rock slabs that are mostly wet, sometimes difficult, but most of all a ton of fun. 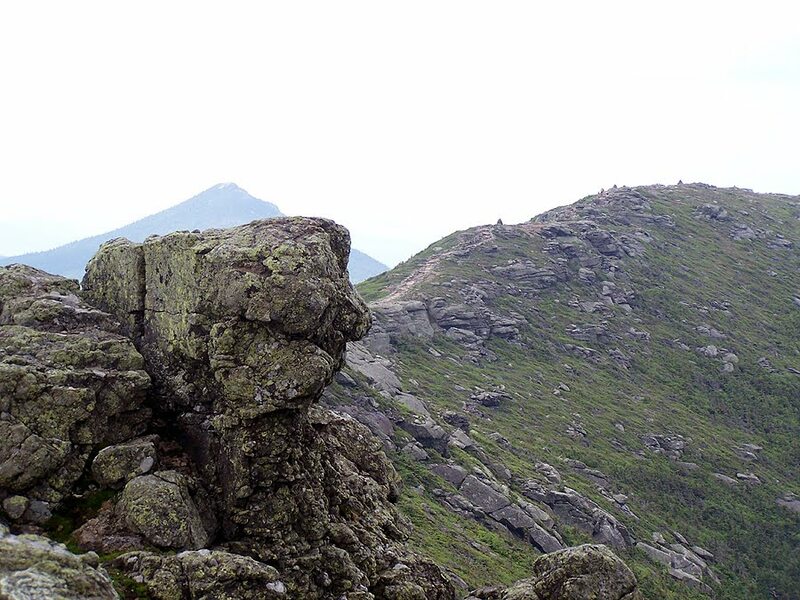 - Once above the Slide I hopped on the Franconia Ridge Trail and made good time over to Little Haystack, along the way I ran into a group of three doing a Pemi Loop. - From Little Haystack to Mount Lafayette the clouds began to roll in and out above 5,000 feet but views where still decent into the Pemi Wilderness and across to the Kinsman Ridge. 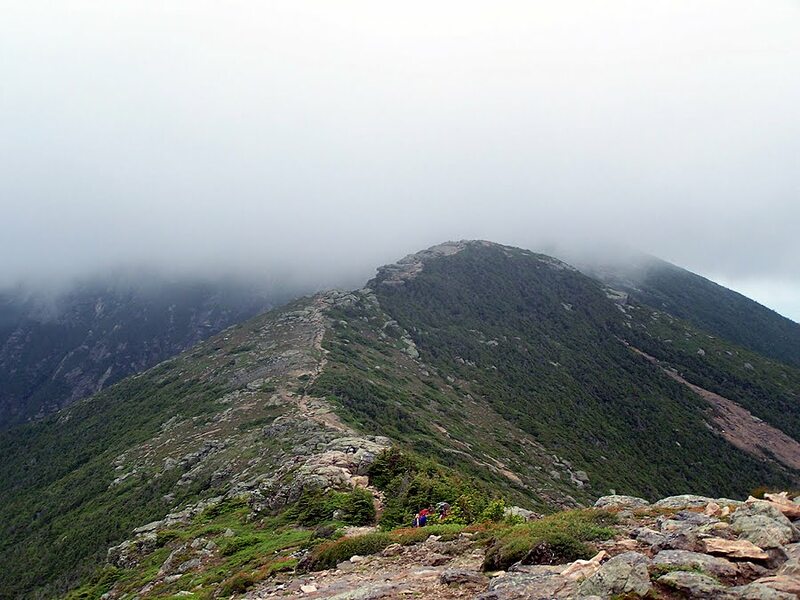 - At Mount Lafayette Summit I ran into a White Mountain Forest Ranger who was researching the flowers in the Alpine Zone and she warned me that the weather forecast called for a chance of Thunder Showers, bummer! - The hike down to Greenleaf hut went fast as usual and I had lunch and warmed while watching the darker clouds come in from the west. 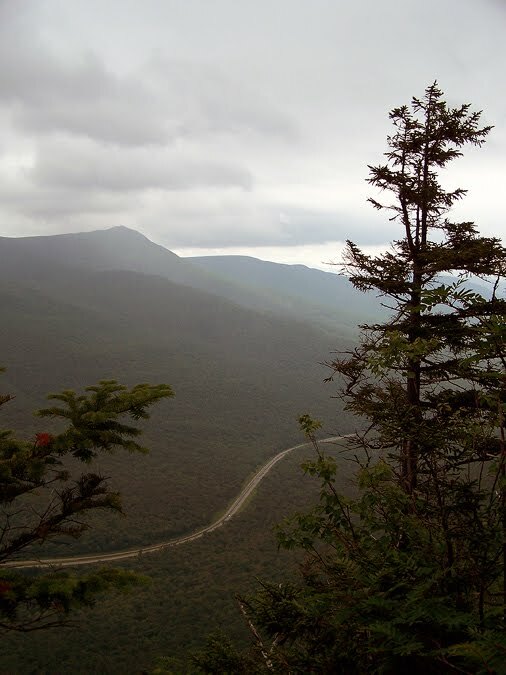 - My original Plan was to hike down the Greenleaf Trail and then head up the Kinsman Ridge Trail from the Cannon Mountain Tramway. 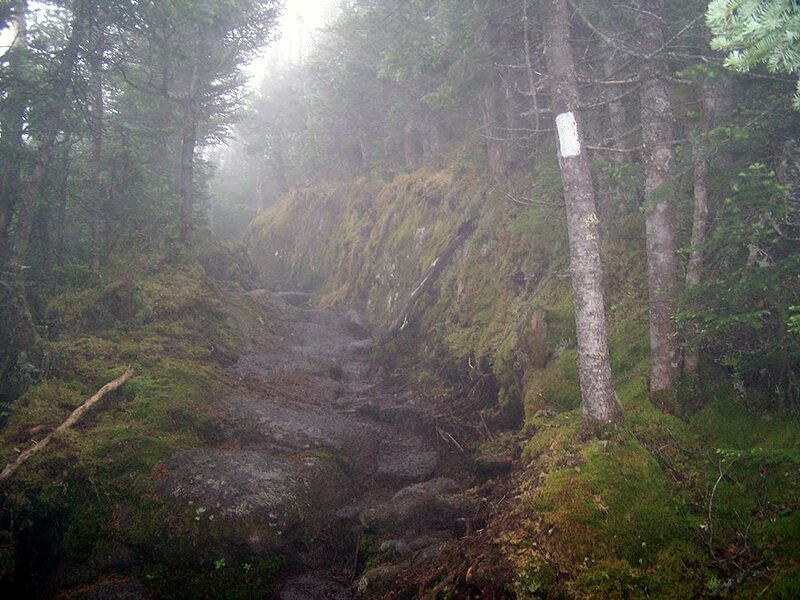 With the weather being iffy I decided to go down Old Bridle Path and then once at the Lafayette Campground Ascend Cannon Mountain via the Hi-Cannon Trail so it would be easy to bail out if I started to hear Thunder. - The hike up to Cannon was steep and it was starting to rain but luckily there was no thunder and there would be none, however now the higher elevations were 'socked" in and there where no views to be had. - I thought about bailing out the Lonesome Lake Trail but said screw it, I've come this far bring on the hike through the Cannon Balls! - Along the way I ran into Steve and Steve who recognized me from a spring time hike in the snow where we saw a guy tumble down a couple hundred feet above Madison Springs Hut in icy conditions. They were both doing a Kinsman Ridge Traverse, it was great to run into you guys again! - The final stretch down the Kinsman Pond and Cascade Brook Trails were pretty awful. The Kinsman Pond is pretty cool and the shelter looks brand new, so that was cool but the rest of the trail is mostly rough and rugged and you're walking in a stream rock hopping for about a half mile! - The rain started to intensify for the last two miles and I was soaked head to toe, covered in mud, sweaty, smelled like "Phys Ed" but was thrilled when I finally reached the car, and in the pouring rain I raised my hands up and had an "Andy Dufrense" moment. - It was a great hike that I probably will never do again!